Don’t settle for a deal on just one item. 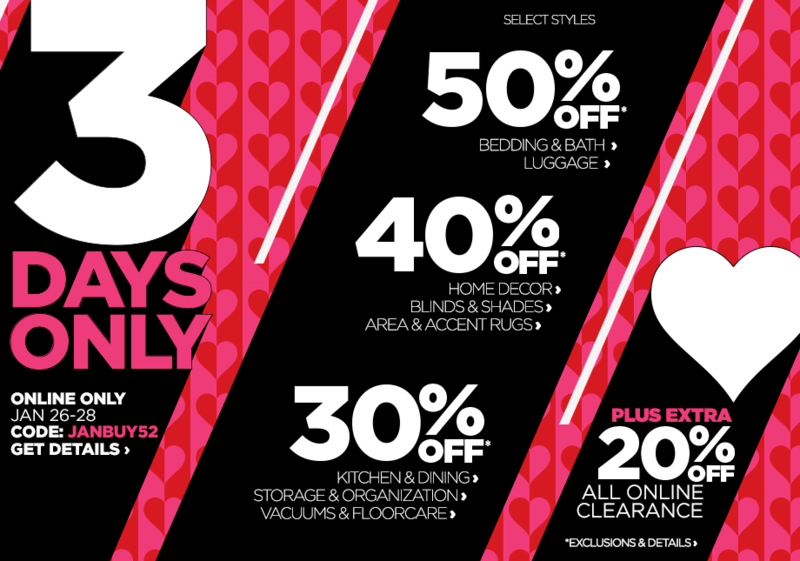 At JCPenney, you’ll find three whole days of discounts on countless products and selected styles. This sweeping sale includes discounts across nearly every department, including 50% off bedding and bath products, 40% off home decor, 30% off vacuums and floor care products, and an extra 20% off in the women’s, men’s and kids’ departments. Plus, you can get an additional 20% off all online clearance items. For example, apply the coupon code to the Dyson DC50 Animal Vacuum Cleaner, and you’ll get the vacuum for $392 instead of $560. That’s a savings of $168. This promotion is good Jan. 26 through Jan. 28. Enter coupon code “JANBUY52” at checkout to score these savings. Check out the sale at JCPenney.